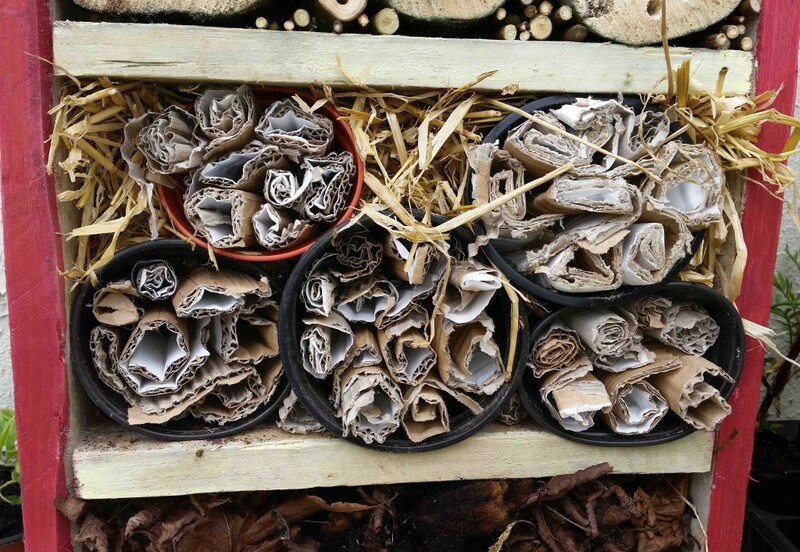 Bug hotels have grown in popularity over recent years as we’ve become more aware of the plight of pollinators and the need to protect and encourage them, but why bother building them a winter home? 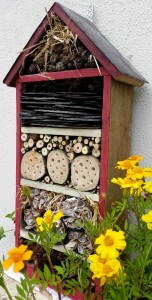 Surely there’s enough nooks and crannies for insects to hang out in without creating bug hotels? You might not even like insects so why encourage more? These thoughts were in my mind recently when I was encouraging two community garden groups to build bug hotels in their gardens. Insect and pollinator habitats are dwindling due to large-scale commercial farming, hedgerow removal and human population growth. A few untidy gardens might not be enough for insects to feel safe and to prosper. Insects are essential to our existence and they need hidey places. 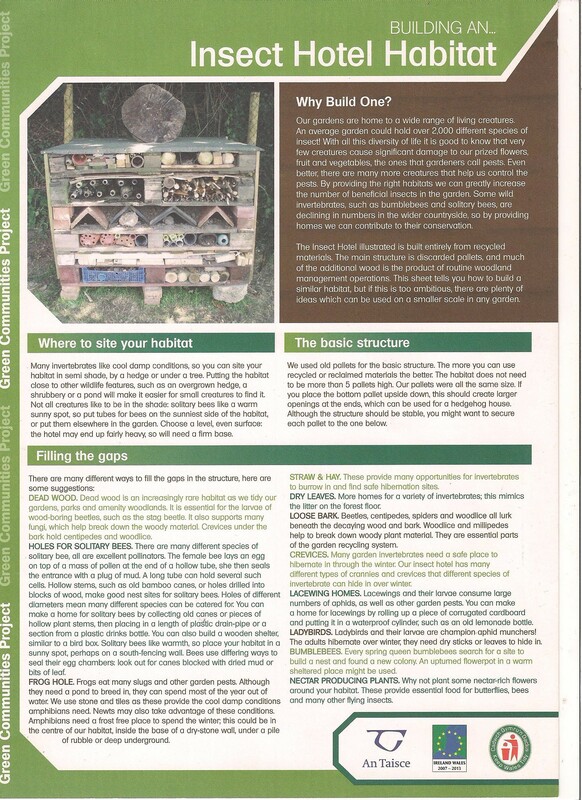 If you need any more reasons to build a bug hotel and get stuck into a garden project that will enhance the space outdoors for you and the beneficial wildlife that surrounds it, here’s three more. Created carefully, bug hotels can provide good temporary residences for solitary bees to nest in and rest their weary heads as they hibernate during the winter months. ♥ There are 20,000 recorded bee species in the world and despite all the publicity honeybees receive, it might surprise you that 95% of the bee species are solitary. ♥ In Ireland we have 97 bee species, of which 76 are solitary bees. 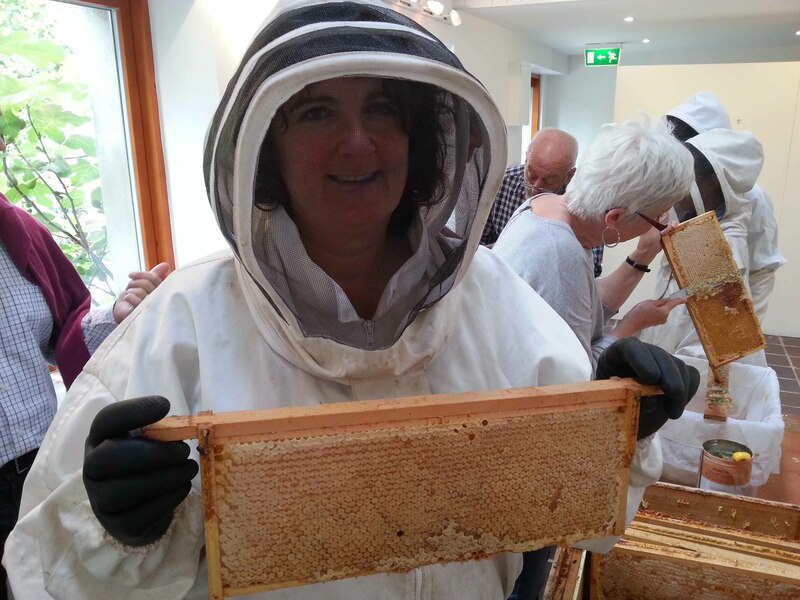 ♥ Of the 100 crops that provide 90% of the world’s food supply, 71 are pollinated by bees. ♥ In Europe alone, 84% of the 264 crop species are animal pollinated and 4,000 vegetable varieties exist thanks to pollination by bees (UNEP, 2010). If you’re able to take a trip to the Delta Centre in Carlow, look out for the bug hotels dotted around the grounds, adding to the look and feel of the gardens. Ian made the skeleton of this small bug hotel out of scraps of wood at home so that I could take it into my horticultural therapy class for the adults to fill. I instantly fell in love with it and, despite already having lots of places for bugs to hang out here at home, would like to encourage more. I can already picture one of these hanging on the wall opposite my kitchen window. Glen na Bearu is an inter-generational community garden project where everyone is being encouraged to reuse and upcycle. 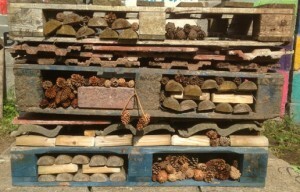 They opted for a large, pallet style insect hotel complex. During my last morning with the group we discussed how best to create the bug hotel and I left them instructions so that they could work on it during the summer months with both the older gardening club and the teenagers who meet there at the youth club. 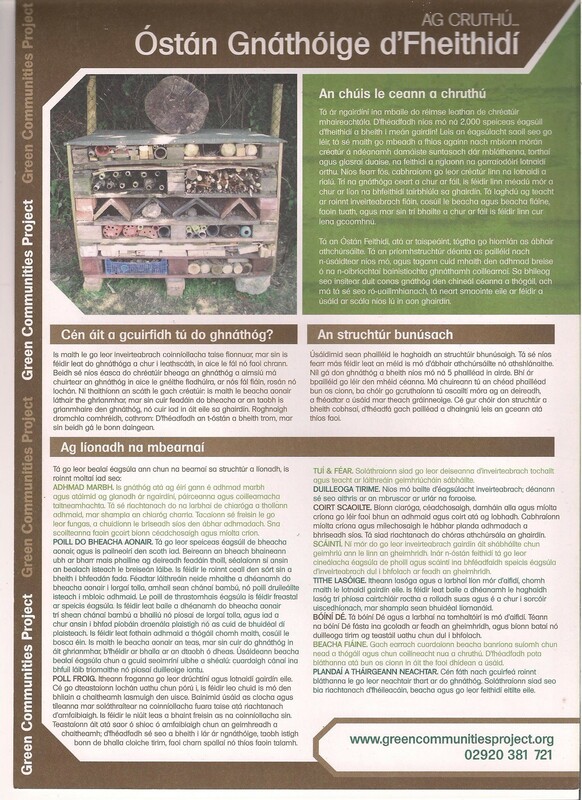 An Taisce created a handout detailing how to build a pallet style bug hotel which they found useful. You can find it here in English or as Gaeilge here. When you build a bug hotel it’s difficult not to learn about the habitats of the beneficial creatures you’re hoping to attract. Ladybirds like dry sticks and leaves to hibernate in while lacewings enjoy bedding down among straw, cardboard and dry grass. These two insects in particular are excellent for keeping aphids at bay as their larvae have ferocious appetites for the little bugs, making them fantastic beneficial insects in our gardens. Castle Activation Unit in Carlow is a day centre for adults with intellectual disabilities. We found that carefully poking the pieces of slate, fir cones and sticks into the bug hotel was like getting stuck into a jigsaw puzzle, something that many of the adults enjoy doing at the centre. Research has shown that puzzles are great for keeping our minds active so not only is this a fun and educational project, it also makes a good therapeutic one too and all the clients who participated in this workshop were delighted with the outcome. Our own children are older now but I know when they were younger they would have really enjoyed collecting all the sticks and cones lying around and adding them to a hotel for the bugs. 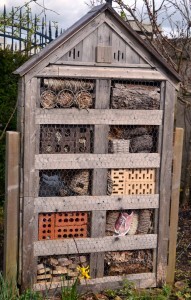 For all the positive reasons I’ve encountered for putting bug hotels in our gardens, I came across one negative from Naturing Nature who suggest that all those interesting holes and crevices can harbour unwanted pests and diseases. Just like a regular hotel, if the toilets aren’t clean and the floors aren’t hoovered regularly, germs can spread. 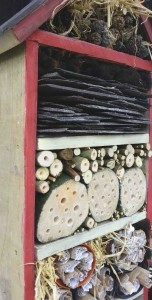 Good husbandry is essential if we want to encourage safety, warmth and welcome in our bug hotels. In the late springtime when the majority of insects have moved out, replace the straw and cardboard and sweep out the slates and bricks that might be hiding unwanted bugs or germs, replacing them with fresh bedding and new places for insects to scurry into if needs be. 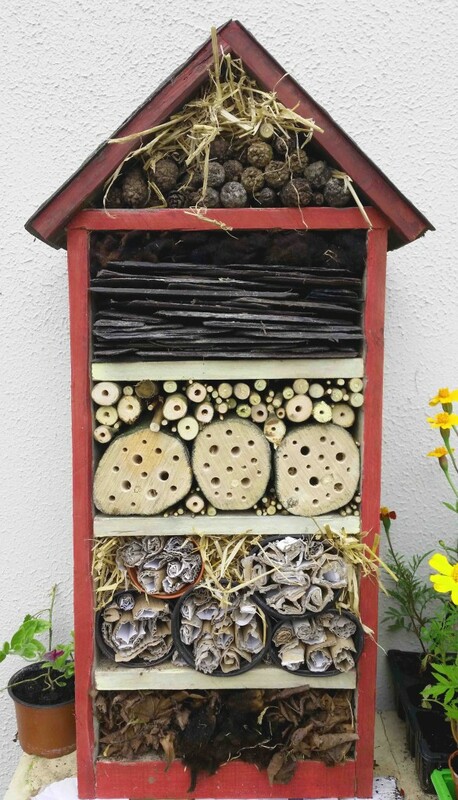 If you’d like to see some more ideas for bug hotels, check out this Inspiration Green page which has some spectacular ideas while the Eco Ecolution blog mentions several ideas for filling your bug hotel.